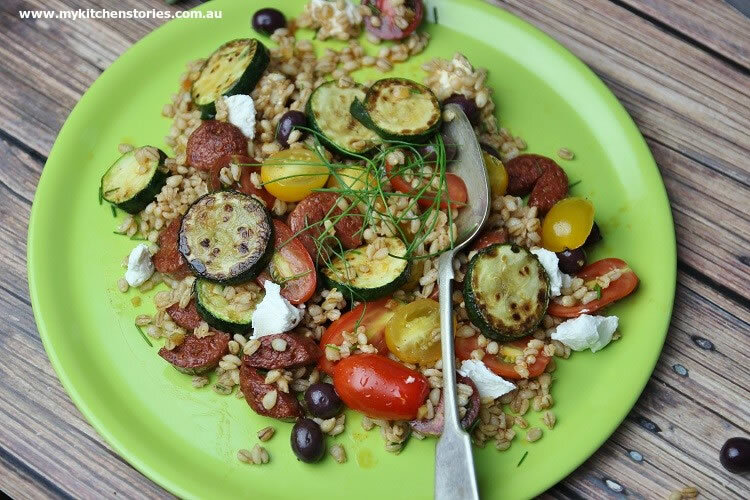 This is a warm delicious salad – Zucchini, Barley, Chorizo Salad, you can make on the BBQ while you are waiting….. I just can’t seem to use up all of the ingredients I have in my pantry before there is one of those pantry raids. All of a sudden I look up and there are moths flying around the fluorescent light and I know I have got marauders in the cupboard again. You can look at it in a number of ways, they are annoying and if you dont watch out they flutter off to your wardrobe and nibble on your tea shirts. On the other hand it probably means that the food in my cupboards hasn’t been blitzed with so many chemicals that there is still something good in the food for bugs to eat! I have a lot of the dry goods in my cupboard from Italy and they are organic and non heat treated (pastas, grains and polentas). I cooked a whole packet of barley and have been using it in all kinds of dishes. However, you can use any Barley at all. This salad is nutty and mixes very nicely with barbecued vegetables and meats. Make up the base of this salad and take it to the bbq. 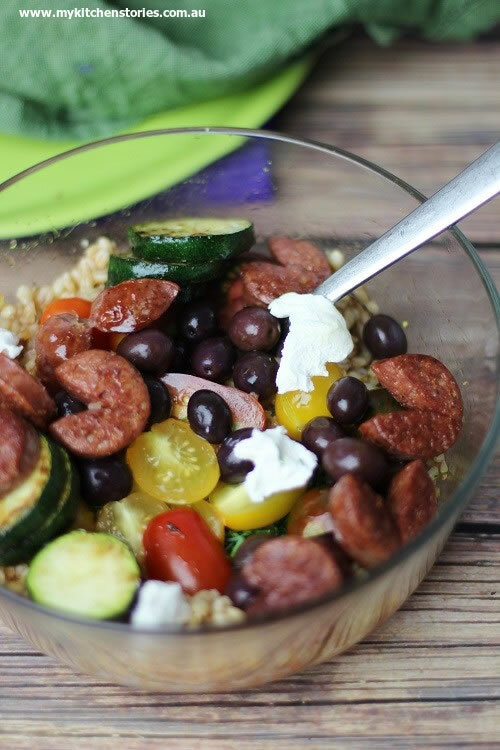 Finish off the grilling and toss together for a delicious warm salad. it is not always easy to write a recipe for a salad. So add or subtract some of the flavourings to taste. You may like more or less lemon or maybe you prefer green olives? Mix the dressing ingredients together in a bowl: preserved lemon, smoked paprika, olive oil, lemon juice, balsamic, sugar and salt. 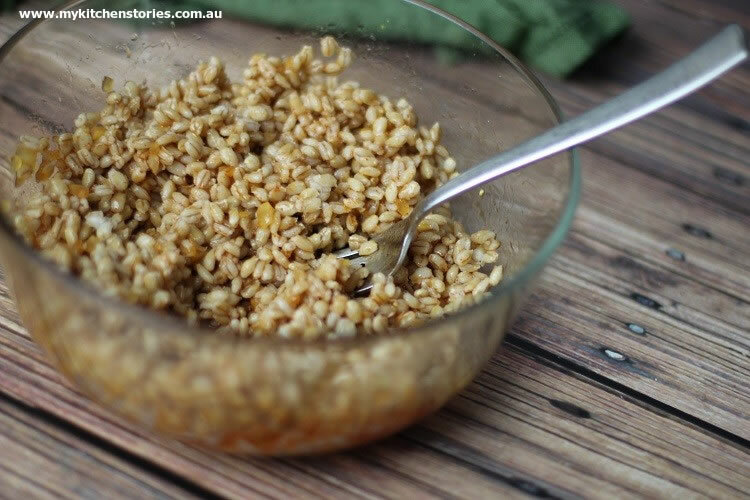 Using a whisk or a fork, whisk the dressing together well till emulsified then mix in the barley and set aside. Add the olives cut tomatoes and chives. don't stir in just leave till later. Toss the zucchini and sliced chorizo in a little olive oil and sear on the BBQ. Add these to the salad bowl and toss gently. 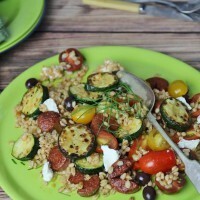 Love the idea of a barley salad! And argh aren’t pantry moths the most annoying blight ever! I hate pantry moths and I swear I get them more often than most. I’ve started putting dry stuff in the freezer for a few days and that helps but one time forgetting and I’m back to cleaning out the pantry. I saw the title of this post in my email and wondered how you were putting barley on the bbq. I know you’re clever. Mine would fall through the cracks. I just had a similar raid in my pantry and filled a huge bucket with the throw away grains. The chooks have been well fed this week! I think part of the problem came from buying grains from loose bin stores. But then I recently bought a packet of Sunrice brown rice ( Australian) with a use buy date somewhere in the distant future, opened the packet and there they were, little grubs. I have covered my pantry with bay leaves, and rubbed the shelves with diluted lavender oil, hoping this helps. 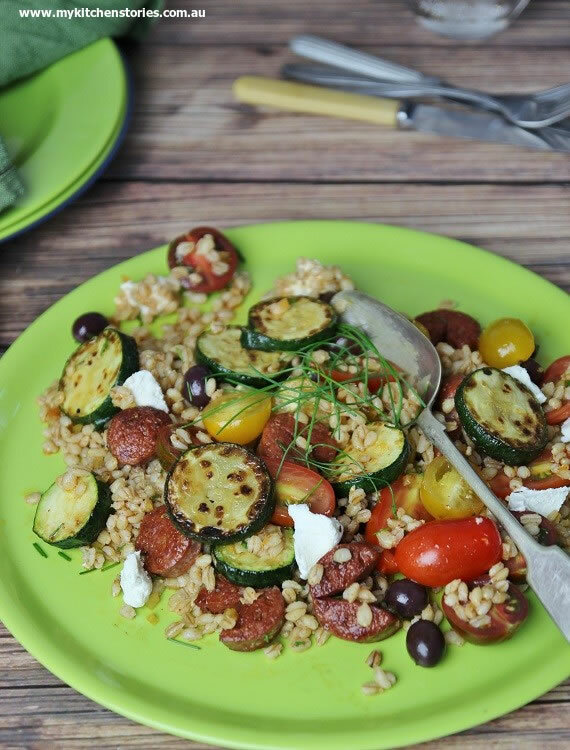 mmm…grilled chorizo, barley, and roasted veggies…an absolutely delicious combination, Tania. A lovely warm salad which autumn certainly would not stop me making 🙂 ! So easy to grill the same indoors!! If I see pantry moths at our place in the near future, I shall cry. We had a horrible time over summer and I couldn’t bear another infestation! This looks like a great use for your barley before the moths get to it, and lovely vegetable toppings too. I’m glad it’s not just me! I saw a moth over the weekend and my heart sank – the warmer weather must be bringing them out. What a beautiful salad and perfect for this weekend. You’ve gotten me so excited for grilling season!! The crispy zucchini is calling to me! This looks like a great salad, Tania. Love the ingredients and especially the dressing. You sure know how to close out BBQ season! And you’re right. I wouldn’t might starting our BBQ season with your salad. Those pantry moths are the worst aren’t they? Although thankfully now that the weather is becoming colder they tend to hatch less. This looks great. I love using barley in recipes! That looks DIVINE. I hate pantry moths and have spent a fortune on tupperware in recent years to try and combat. So far so good. I bought some bulk spelt flour from a local shop’s flour bin the other day and was very impressed to see a bay leaf fall out when I was using it. No pantry moths there!